Staplers are not all created equal. There are definitely some that are better than the others and one company that makes the best staplers available is Novus. They have a first-rate lineup of professional-grade products including the B5FC, a flat-clinch model. This product is ideal for anyone needing a good stapler and it has a lot of great attributes, including an impressive stapling capacity. Here's a closer look at this product's strengths (and weaknesses) so you can see just what it has to offer you. As mentioned above, this product can fasten a lot of sheets of paper. It has a phenomenal stapling capacity of 50 sheets, which is quite high for a desktop device. The B5FC is a flat-clinch unit. This means it completely flattens the legs of the staple. Documents fastened with flat-clinch devices take up 30% less room and they lay totally flat, as opposed to papers that were processed with a standard stapler. In addition to flat-clinch fastening, the B5FC can open up so you can tack your items to a bulletin board or wall. It can also temporarily pin your documents together so you can remove the staple easily and not have to deal with paper clips and such. It's also easy to switch between stapling modes. All you need to do is turn the anvil that's located on the base of the device. The B5FC was designed for high performance and you can get the best results by using Novus staples with it. The 24/6 and 24/8 Super fasteners are the ones you should look for. Loading this front-loading stapler is easy. Just press the red button on the back of the unit and you can pop the staples in. Since this is a Novus product, it is very durable and well-constructed, so it will last a long time. It also looks great and is available in three colors: gray, blue, and black. Finally, the B5FC has a super long 10-year warranty. Chances are you won't need to use it, but it's nice to have anyway. The primary weakness of the B5FC is that it has a very short throat that's less than 4 inches long. This means this device isn't capable of doing center-stitch fastening. A separate stapler will be needed if you routinely do that kind of work. This product is a bit expensive for the average home user which means some people might not be willing to buy this it despite its many strengths. Some people might wish there were more colors available. Gray, blue, and black are perfect colors for professional environments, but potential buyers that work in creative professions might want more interesting colors. Overall, the Novus B5FC flat-clinch stapler is the perfect choice if you need a high-quality device for your desk. It has a terrific stapling capacity for a desktop unit and it's very well-made. 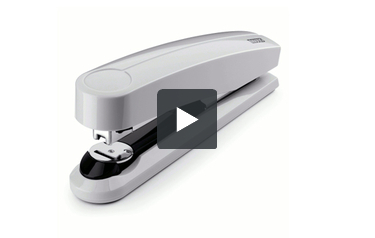 When you buy this product you won't need to think about buying another stapler for years.